PT Minerva Motor Indonesia (MMI), aligning himself with the very serious other top car manufacturers. 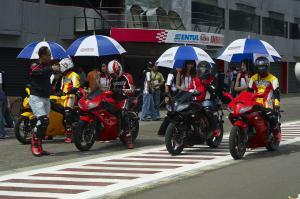 MMI also focus on the market use Indonesia motor sport. After updating the machine body and his Minerva 150 a month ago, now Megelli 250 MMI fix his machine. The model is still the same, but the engine was updated to Megelli Anyar could be more speeding again. Both are Megelli Megelli 250 RE and 250 RV. To prove the engine best performance, MMI held a "Megelli 250R Performance Riding Experience, an event and test drive Megelli Anyar introduction to the media at the Sentul International Circuit, Thursday, June 3, 2010. On a very positive response from the previous variant Megelli 250, MMI, said its President Director Kristianto Goenadi, must compensate for the new variant with high performance engines. This new Megelli machine can produce up to 27 ps at 8500 rpm and maximum torque of 22 Nm/7.000 rpm. "Speed is certainly going to give different sensations in the acceleration and performance," said the bespectacled man. This new product will complement the 250 Series Megelli making a total of seven choices. Director Megelli UK, Simon Brown, who attended in Jakarta at the moment when the test ride the latest Megelli these states have been through stages of experiments performed Megelli Sachs UK and Germany, so the quality is maintained. Megelli presence is unique. This blend of many of the motor state. For parts, Kristianto said some came from Indonesia and Taiwan. For machinery worked Sachs Germany automotive company that was established in 1886. 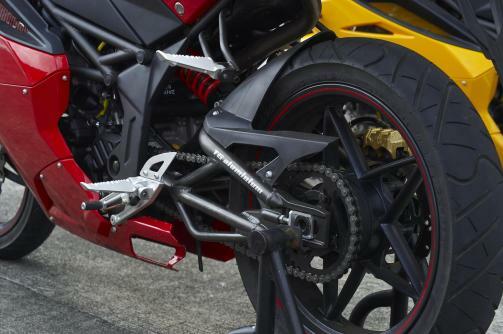 Especially for this latest Megelli, Sachs is also collaborating with Progettie Sviluppo (R & D engine known from Italy). While for the body, of course tilled Megelli United Kingdom (UK), which is known as a world-renowned motorcycle designer. Among other things, Triumph, Ducati and Polaris. A number of fellow automotive journalists and bloggers who claim that the motor testing - Megelli than a sporty body also had a high intake. Some reporters could even touch the top speed up to 157. In fact, products with the old machine, at least about 120-years only. "Handling is also a comfortable bike,"said Kus. 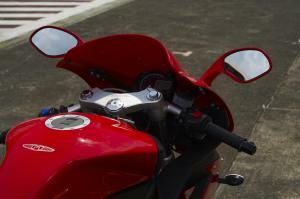 For now, Megelli only deal directly with the Kawasaki Ninja 250R. Compared to its competitors, the Megelli comes with more attractive price with a price range from USD 26 to USD 34 million. Available choice of four colors, yellow, red, black and white (special 250R). 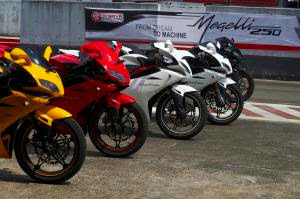 Now, this is the full price, Megelli 250R 29.1 million, 31.9 million Megelli 250RE, 250RV Megelli 34.9 million, idr 26.1 million Megelli 250S, 250SE Megelli 28.1 million, 27.1 million and Megelli Megelli 250M 250ME IDR 29.1 million. Kristianto sure future sports bike market will rise. Throughout the past year, sales were pretty good Megelli. First emerged in Indonesia since April 2010 until now, Megelli units have been sold until 5519.